The stop-motion animation studio Laika follows up their superlative work on Henry Selick's 2009 Coraline with another adventure-horror film that offers material challenging not merely for its emotional darkness but for its moral complexity. Certainly no other kids' film that comes to mind begins within a cheap zombie film in Academy ratio, complete with sight gags like the doomed woman finding sexual poses in which to scream in mortal terror and a boom mic that casually floats into frame. When the camera pulls out to show the young boy watching this flick, however, his banal choice of brain-draining entertainment soon reveals itself to be the least unorthodox aspect of ParaNorman. Norman chats with his grandmother about the shoddy film he watches on an old TV, but when Norman goes to his dad to ask him to turn up the heat for her, the whole family's stunned, angry response reveals the grandmother to be dead for some time. But Norman can still see and communicate with her, just as he can see and converse with all the other incorporeal spirits of the dead who dwell in the town of Blithe Hollow. This leads to several intriguing setups and amusing gags in its own right—especially the sight of a ghost bird flapping around still gagging with a six-pack ring still 'round its spectral throat—but soon Norman finds himself thrust into a situation that forces the bullied, outcast child to reevaluate some of his own behavior toward others, all while genre tropes get a clever, but still family-friendly, tweak. Tasked with using his special gift to help keep a centuries-old witch's curse at bay, Norman soon finds himself inadvertently setting off a zombie invasion that utilizes stop-motion brilliantly. What better monster for the arduous, slow, steady art of stop-motion animation, after all, than the lumbering zombie? 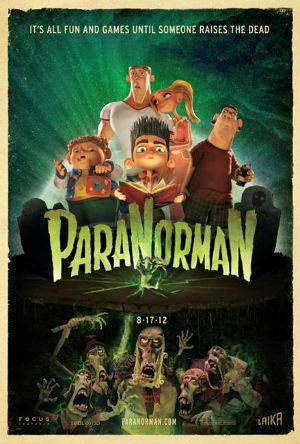 Cast in a grindhouse-ready color palette, ParaNorman makes references to several classic horror films (this writer's favorite being a shot of Norman briefly noticing a figure watching him at school in a shot pattern that clearly recalls John Carpenter's Halloween), but the blend of physically three-dimensional objects and 3D rendering gives the animators space to craft their own distinctive look. Complementing the omnipresence of death and the lingering spirits thereof, Blithe Hollow itself appears to be in some form of decay, with long close-ups of rusted bikes and the faded colors of cookie-cutter suburban planning adding to the suffocating necrosis as much as the later descent into (PG-rated) hell. Ironically, however, the animation makes everything feel so alive. When the long-dead reanimate and terrorize Norman and the rest of the town, their jaws slack with felt weight. Their severed limbs spring back into action with a physicality that makes the haphazard, groping movement, however comically planned, also creepy. Plenty of gorgeous computer animation surrounds the characters, especially in the rolling vortex of smoke that erupts over the town halfway into the film and mocks Norman with the witch's visage for the rest of the movie. But ParaNorman's impact can always be traced back to the old-school techniques that truly drive the film forward. If Laika outdo their sterling work on Coraline in terms of technical skill, they also craft a richer story that places even more faith in a young audience to brave scary moments and understand multiple, multifaceted themes. The film validates the town's legend of an executed witch, but it does so in a manner similar to Carl Dreyer's great Day of Wrath. That film ran counter to many anti-witch hunt narratives by showing a puritanical mob actually cornering a real witch, only to make that fact irrelevant in light of their sadistic torture and murder. The further ParaNorman gets into its own narrative, the more it complicates the sense of culpability around the witch now getting her delayed vengeance. More important, however, are the lessons embedded in this subtle narrative twist. As the story gradually aligns the villain with Norman, both bullied outcasts feared and persecuted for their special abilities. Yet ParaNorman goes one step further to examine how bullying can often forge powerful bullies out of victims eager to get payback or at least see someone else suffer as they suffer. Where so many movies celebrate the teased fighting back against the oppressor, this movie makes that revenge the source of its horror. Where Coraline both bolstered and subverted its strong female protagonist by making her stubborn self-sufficiency her greatest virtue and weakness, ParaNorman makes the audience long for a comeuppance against Norman's tormentors at school and at home, only to show revenge so all-consuming that even the punishment of those guilty of heinous acts becomes repulsive. Here is a movie that knows how nearly impossible it can be to break the chain of suffering but begs us to do it anyway. This, of course, requires the acceptance of those who are different, even frightening, to some. In that light, even the tossed-off joke of a character's revealed sexuality at the end serves as a vital message for children and, sadly, many of their parents. I saw the movie in a theater full of families, and while there were certainly many silent parents (along with a few confused peeps by their kiddos), I did overhear a mom and dad having a conversation about it with their son afterward. They didn't try to force him into any way of thinking, just asked him what he felt about it. I didn't overhear for too long, but he seemed to really pick up the movie's message of acceptance, and hearing that made the movie all the better for me. Your movie information are nice.These are very nice.I like to see this movie suddenly.Thank for your post. I wasn’t expecting much going into this one. The trailers made it look kids movie and strange for the sake of strangeness but I was amazed with the end product. The story deals with things not usually discussed in a kids movie and presents the ideas in a very mature way.